Twitterrific has received a useful update adding a smart “Edit Tweet” button to the free application. The button is indeed a clever addition to the app since editing published tweets isn’t something Twitter allows, and as such the functionality isn’t offered in the official Twitter iOS application. However, by deleting a published tweet and then pasting its contents into a new Compose Tweet screen, developer The Iconfactory is able to provide iOS users with the illusion of a useful Edit Tweet feature. Twitterrific has also received a couple of performance enhancements (one improves launch times for multiple users, and the other tweaks how the application’s tweet-streaming feature runs), and a selection of bug fixes have also been made. But it’s the new Edit Tweet button that Twitterrific users will appreciate most. As a reminder, Twitterrific received an update last month switching the app into an ad-supported “freemium” application. 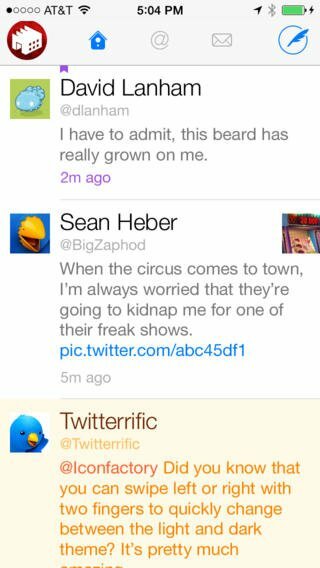 Though Twitterrific had been a paid app for some time, the move actually marked a return to the freemium model for The Iconfactory’s four-year-old Twitter client. If the official Twitter app is giving you a headache, take Twitterrific for a spin. Thanks to its latest update, the application is now better than ever. Twitterrific can be downloaded on the App Store free of charge, and it’s optimized for the iPhone, iPad, and iPod touch. See also: Apple Said To Be Prepping A Bug-Fixing iOS 7.1.1 Update, Are Gesture-Based Unlocking Tools Coming To Apple’s iOS?, and Smile’s PDFpen Scan+ Gets Updated For iOS 7, Adds Refreshed UI And More.